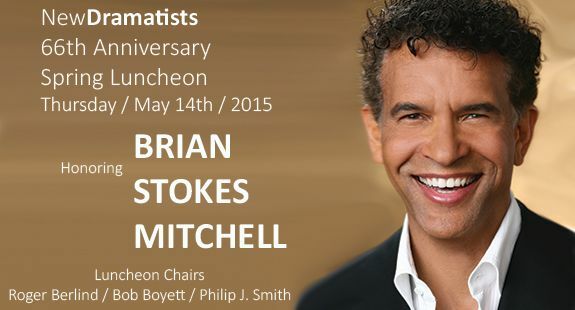 This spring, New Dramatists is honored to recognize Brian Stokes Mitchell, dubbed by The New York Times as Broadway's "last leading man." Mr. Mitchell has enjoyed a rich and varied career on Broadway, television and film, along with appearances in the great American concert halls and has distinguishably served for 10 terms as Chairman of the Board of the Actors’ Fund. His Broadway career includes performances in MAN OF LA MANCHA(Tony nomination and Helen Hayes Award); KISS ME KATE (Tony, Drama Desk and Outer Critics Circle Awards); RAGTIME (Tony nomination); August Wilson’s KING HEDLEY II (Tony nomination); KISS OF THE SPIDER WOMAN; JELLY'S LAST JAM; David Merrick’s OH, KAY! and MAIL, which earned him a Theatre World award for outstanding Broadway Debut.